Perhaps it’s a beautiful day out, nice blue sky, lazy sunday for a slow walk, no where to be, no rush. Are you in a hurry? I hope not. 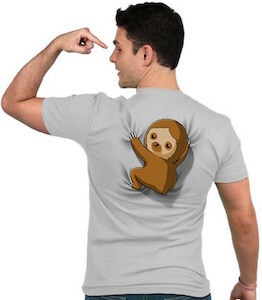 This is a very funny t-shirt that brings two incredibly slow moving animals together, find a sloth riding on the back of a turtle, which is perfect as the move at they same pace. Made to be both comfortable and durable this t-shirt is available in a huge range of sizes from Small to 3XL and your choice of 8 colors and you can this print on the front or back of the t-shirt. Be sure to check out all the other clothing like hoodies and women’s fitted shirts that you can get this sloth riding a turtle print on. Slow things down and get this Sloth Riding A Turtle T-Shirt.